Klein Buisfontein Ranch is an intensive game-breeding enterprise run on relatively small land. According to Colin, a rare-game breeding concern should be based on sable antelope, roan antelope and buffalo. Colin and Marisa Engelbrecht of Klein Buisfontein Ranch took over an operational cattle farm 11 years ago. By using the best genetics available to breed certain predator species and several selected colour variants of some antelope, they are successfully breeding high-value game species. ‘White’, ‘Black’ and ‘Copper’ springbok (selected colour variants of Antidorcas marsupialis). They also breed 10 other antelope species including impala, blesbok and giraffe. Predators (of which some are colour variants) include black leopard, black jaguar, cheetah, white lion, Bengal tiger and serval. The Engelbrechts breed predators to sell to other game ranches and contribute to their long-term survival, since their numbers are declining drastically every year, says Marisa. A law graduate, she bade farewell to the corporate world to concentrate on the predator breeding programme. “By keeping and breeding them in a camp system and enclosures we can monitor them closely and detect illness and disease almost immediately,” she explains. Marisa and Colin Engelbrecht with their sons Kyle (left) and Darren. Kyle is holding a white lion cub. Klein Buisfontein Ranch consists of six camps ranging from 25ha to 50ha. Each camp has its own watering point supplied from boreholes. The remainder of the farm is undivided. Camps are structured according to the needs and requirements of each high-value game species, whether they are browsers or grazers. The vegetation on the rocky soils consists of mixed bushveld vegetation with woody species such as buffalo thorn (Ziziphus mucronata), sweet thorn (Acacia karroo) and white stinkwood (Celtis africana). Grass species include red grass (Themeda triandra) and Smuts finger grass (Digitaria eriantha). Around 6ha of irrigated lucerne and 50ha of dryland Smuts finger grass provides additional winter feed. 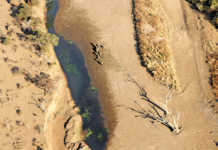 The annual rainfall is between 400mm and 600mm. Temperatures vary from below freezing in winter to the high 30s in summer. Converting Klein Buisfontein Ranch from a cattle farm to its present use called for a great deal of infrastructural development. “There was virtually no infrastructure for game breeding,” Marisa recalls. Colin and Marisa completed the initial infrastructure in about six months, and the camp system is based on an ecological study by Ekofocus Wildlife Services. Ecologically sound planning ensures long-term sustainability, according to Colin, and infrastructure continues to be expanded. He explains that, as with any farm, their high-value game operation requires ongoing housekeeping. Klein Buisfontein Ranch employs eight permanent and six temporary workers, all of whom are trained in all aspects of the operation. These include care, feeding, carcass processing, and health and safety – vitally important when working with dangerous animals such as buffalo and carnivores. Parasite control is a major challenge on the ranch. A Tickoff system in a small enclosure – to which the animals are attracted through the use feed – in each camp helps to control ticks by automatically applying acaricide such as Amipor or Deadline according to the animal’s weight as soon as it enters the enclosure. A strict inoculation programme is followed, with animals inoculated against anthrax, botulism, and blackleg, among others. Inoculants are administered via a dispensable drop-off dart. Additional feed is supplied in winter. Except for the feed used to attract the animals to the Tickoff systems, no additional feed is supplied in summer. A phosphate lick is supplied in summer and a protein lick in winter. An animal nutritionist formulates feed rations using lucerne, Smuts finger grass, maize, phosphate, molasses and trace elements. The ration is mixed and supplied daily according to the species’ average bodyweight. For example, a 3,5kg ration is supplied for buffalo and a 0,5kg ration for springbok. An extensive bush encroachment control programme aimed at common guarri (Euclea undulata), velvet raisin (Grewia flava) and alien vegetation, conducted by applying the hormone-based arboricide Molopo, has proved to be highly effective. Brushoff 250, a water-dispersible granular crop herbicide, controls certain broad-leaved weeds and invader weeds. A total of 50ha of bush remains to be eradicated. Although application by hand is labour-intensive and time-consuming, mechanical eradication is too expensive. Some areas are deliberately left uncleared to return nutrients to the soil by decomposition. A mixture of Bromacil 800, a suspension concentrate with long residual action as a soil herbicide, and Roundup is applied along the fences every two years. The Bromacil 800 is sprayed with a knapsack sprayer at a rate of 1,5kg/ha to control alien vegetation such as milkweed (Gomphocarpus physocarpus) and prickly pear (Opuntia ficus-indica). 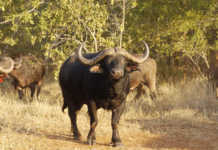 Removing alien vegetation and combating bush encroachment has increased the carrying capacity of the farm to such an extent that buffalo can be stocked at 7ha/MLU and roan, sable and wildebeest at 3ha/MLU. “The land was used for livestock farming and was terribly overgrazed,” Colin recalls. Stocking rates, according to carrying capacity and the habitual and dietary requirements of the species, was determined with the help of an ecologist. Species composition, as well as the social and spatial needs of the animals were also considered. “Colour variations in game animals occur naturally but are extremely rare. They are thus not solely the result of selective breeding programmes,” Colin explains. He says that a colour variant has a distinct phenotypic difference (colour and/or pattern) and is genetically similar to the original species, with just a few genes that cause a deviation from the normal colour. Colour variants exist worldwide among many species, such as black jaguars and black leopards. According to Colin, anecdotal evidence suggests that in the past colour variants were hunted due to their ‘abnormal’ appearance, reducing the frequency of this gene within the species. Today, game breeders are establishing breeding projects to rectify the situation, he says. The Engelbrechts foresee a bright future for game ranching in South Africa. It makes a considerable contribution to the economy and food security, contributing almost R20 billion to the GDP as well as nearly 100 000t of meat a year. 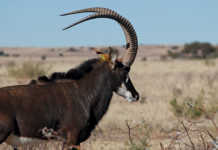 According to Colin, buffalo, sable and roan antelope should form the basis of any high-value game breeding enterprise. These animals are sought after for breeding purposes and offer exceptional hunting value. Marisa adds that nyala are a good option for new breeders. 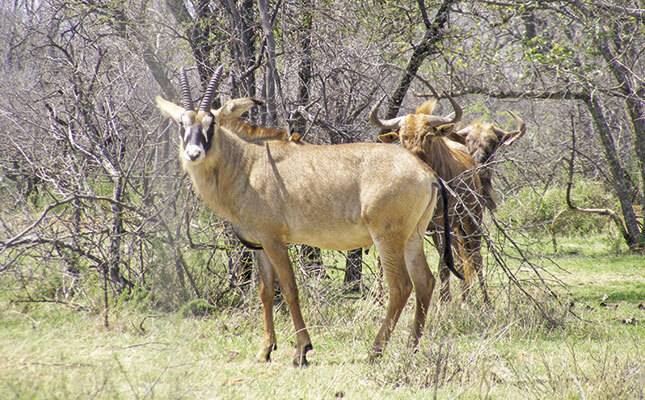 According to her, sable antelope, roan antelope and buffalo prices remain relatively constant. The average heifer price is currently around R250 000 for sable, R300 000 for roan and R350 000 for buffalo. Colin says that legislation to legalise the trade of rhino horn is urgently needed, as not doing so will be devastating for the animal’s survival. “Policymakers must address current legislation affecting the game industry,” he says. “In SA, each of the nine provinces has its own nature conservation authority, ordinance and regulations. This impacts on our business. We need uniform legislation across the provinces. Phone Colin or Marisa Engelbrecht on 072 614 6959 or email [email protected]. For more information, visit www.kleinbuisfontein.co.za. This article was originally published in the 23 October 2015 issue of Farmer’s Weekly.